July is a busy month on the Camino de Santiago, as far as festivals and celebrations go. Two of the most high profile festivals on the Camino take place this month: Saint James Day and all the festivities around 25th July in Santiago de Compostela, and the world famous San Fermín bull run in Pamplona, on the French Way. Feirón Medieval dos Andrade is a Medieval-inspired festival taking place in the surroundings of the Andrade Tower in Pontedeume, the coastal town along the English Way to Santiago. The medieval fair takes place each year in early July. Over three days, the town hosts all kinds of Medieval-related activities: from birds of prey flying displays to a Medieval banquet, music and dance, archery and even a torture exhibition. Betanzos, also on the English Way, also hosts a Medieval-inspired festival from 11th-13th July. This celebration has a very maritime feel, as the coastal village of Ribadesella, along the Northern Way, celebrates the patron of fishermen and sea people in early July. The village of Cea, on section 10 of the Vía de la Plata, has a museum dedicated to its famous bread but also celebrates a gastro-festival each July to honour its most celebrated produce: bread. Another unique gastronomic festival, this time on the Portuguese Coastal Way and ideal for seafood lovers, is the lobster festival in A Guarda, taking place from 4th July. The running of the bulls that fascinated writer Ernest Hemingway and so many other visitors kick start with the ‘Txupinazo’, the official launch of San Fermín, on 6th July. 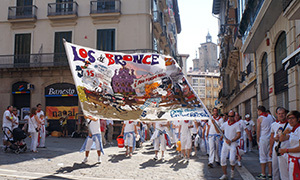 The bull runs start on San Fermín Day, 7th July, the party’s Big Day. For a whole week of festivities, city dwellers and visitors wear the classic San Fermín ‘uniform’: white clothes and red scarf. The party will finish on 14th July with the singing of ‘Poor Me’, mourning the end of the San Fermín … for another year. Palas de Rei on the last 100km of the French Way route to Santiago celebrates its local festival in honour of San Cristobo (Saint Christopher). Your chance to experience a typical Galician small town festival and get a bit of dancing into your Camino. Pontevedra city honours San Bieito, considered one of Galicia’s most prolific miraculous saints, in July. Since the Middle Ages, people go to San Bieito to get problems of various kinds sorted. At lunchtime, there is a ‘popular’ mussel party and Galician music, so you get to taste the local seafood too. The town of Silleda on the Via de la Plata from Ourense to Santiago celebrates its ‘festas patronais’ dedicated to Santa María with two days of music and entertainment, as well as a paella festival, where a giant paella will be cooked for participants. 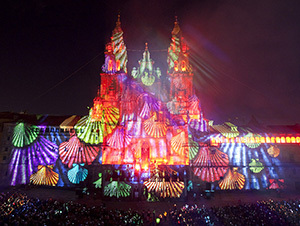 25th July, St James Day, is the most important festive day in Santiago de Compostela and also Galicia’s national day. If you are in Santiago de Compostela for its biggest day, don’t miss the fireworks in the Obradoiro square, as well as the evening concerts and street entertainment. When the 25th July falls on a Sunday, it will be a ‘Holy Year‘ (Ano Xacobeo). Many other towns in Galicia celebrate Santiago’s Day, St James, including Padrón, on the Portuguese Way, with its Romaría de Santiago Apóstolo and the city of Pontevedra, also on the Portuguese Way, with its Festas de Santiaguiño do Burgo. This year, San Sebastián celebrates the 49th anniversary of its International Jazz Festival, probably the best of its kind in Spain. If you are travelling the Northern Way from 23rd to 27th July, make a musical stop in San Sebastián. Festa da Praia (Beach Party) at Langosteira Beach in Fisterra, is a popular event among locals and tourists. Over a hundred free concerts, fun fair, fireworks… the city of Geneva hosts every year a month-long celebration, called Fêtes de Genève or Geneva Festival.